Ok back in business and straight into the heart of the metropolis of Tamworth, or at least round the edges of the centre to have a look at the Anglo-Saxon to medieval defences that once surrounded Tamworth. This post is riding the wave of Anglo-Saxon popularity of which Tamworth of course is in the premier in this field. The defences compared to other subjects in Timehikes have had considerable time and research, internet space dedicated to them so below I´m going to review the work done by archaeologists, historians, witnesses, map makers before going on to suggest a few ways of promoting the elusive defences. 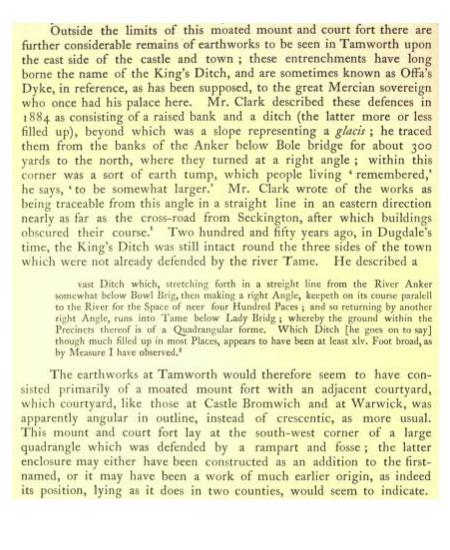 The defences, known variably as King´s ditch, Offa´s dyke and Walferlong are connected with the very origins of the name Tamworth, they add the worth bit in the name, meaning enclosure, Tamworth = enclosure by the river tame( that´s one translation). That the defences are very ancient is testified by evidence of even older defences going back to at least the 8th century but more of that later. This is an excellent collection of previous accounts. From 350 years ago when the ditch was clearly visible on the 3 sides to descriptions in 1884 of the north-west corner of the defence line. The story of the defences is one of gradual to quick disappearance to partial rediscovery by archaeologists. Falling out of use between the reigns of Richard II and Henry IV, they were still very present as the ´kings ditch´ in the 1600´s( see above, Dugdales account) although filled up in places. 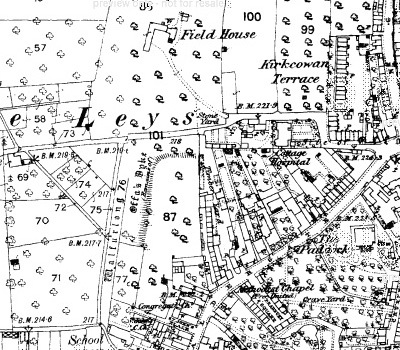 In the 1839 map below, they are marked on the eastern side of the town as King´s Ditch, so they were at least still present on the eastern and western sides. 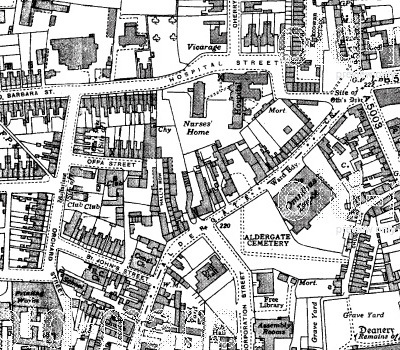 At some point between the 1886-1900 the visible North-western portion was built on and the northwestern course was followed roughly by terraced housing. 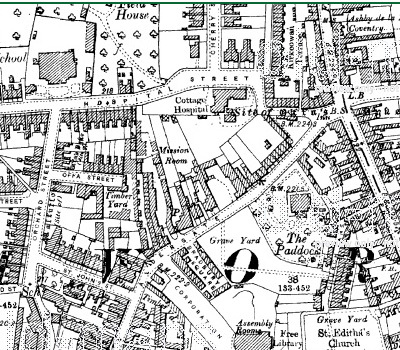 In the 1901 ordnance map they are marked as ´remains of´ in the vicinity of the aforementioned terraced houses and along Hospital Street. ´Remains of´ could be inferred as that there was still evidence of the Defence line at the turn of the 20th century. At some point before 1938 they become ´site of´ , which could be taken as that there were no longer remains and have become a ´memory´ commemorated by the nearby Offa street. Parallel to it´s dissappearance and it´s conversion to memory and then history, archaeologists appear in the scene in the 1960´s-1980´s. A number of small excavations are carried out in response to building work. Below I´ll outline some of their discoveries. This is a bit of mish mash of reports and is quite difficult to outline so sorry to misquote but it gives an idea of the conclusions of the excavations.Many of the excavations were carried out by Gould in the 60´s and 70´s, his excavations on brewery lane revealed possible different phases. There´s the hypothesis that the defences correspond to King Aethelfaed´s action in 913 written in the Market charter´He went with all the Mercians to Tamworth and built the burgh there in the early summer´. The construction of fortified burhs during this period marks an important transition in the development of towns, Tamworth being a significant example. The ditch with a turf built rampart , with frontal timber revetments and wooden strapping found at the brewery lane site was ascribed to this Aethelfaed period. Gould also found evidence though of earlier pre-Aethelfaed sequences. It´s described as a ´palisaded trench´. 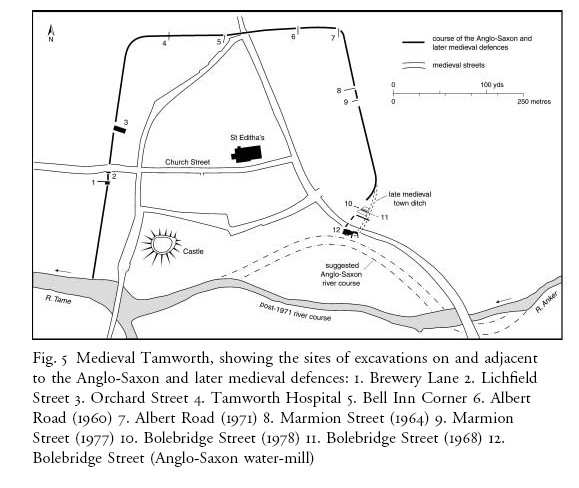 It seems quite certain that there was a pre late saxon defence and there´s speculation that it originated in the royal defences of the royal site of Tamworth in the mid-8th century mentioned in the Market charters. 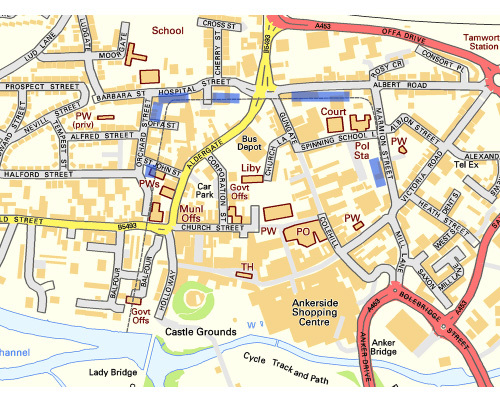 map with excavations and original medieval streets, again the above map is again copied and pasted from Bassett, S, Divide and Rule, The military infrastructure of eighth and ninth century Mercia. thankyou! A commemorative heritage gastronomic trail or pub crawl. 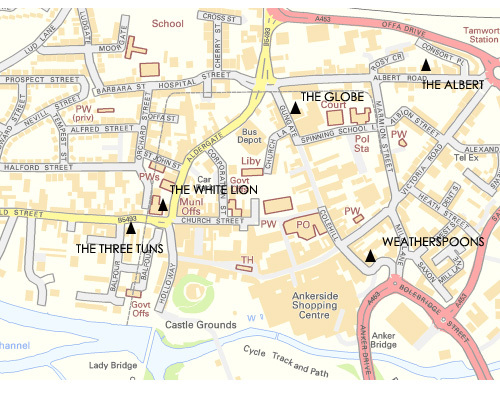 How about a pub crawl along the course of the ancient defences . This can be taken in a more leisurely or decadent way depending on your style. 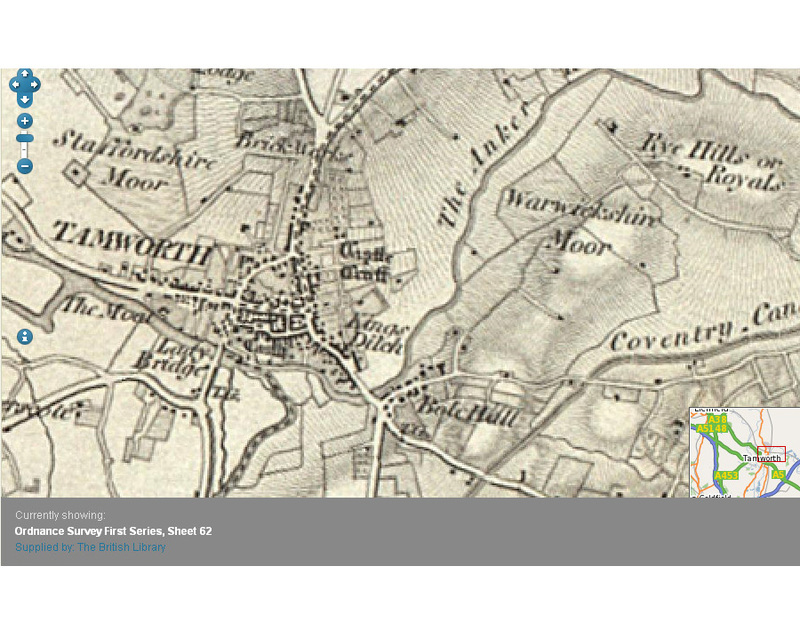 This could integrate Tamworth heritage pub initiative and the Mercian trail promoted by the local council. Ok here goes, start at the eastern side of the ditch, at the Weatherspoons. It´s best to start here as a: it´s very cheap and b: you miss the rush of hundreds of people later on. Take your time here as there awaits a long walk along the eastern course to the next watering hole, the Albert Inn. This is not right on the course of the defence but it´s near enough. This is an old-school boozer as are most on the itinerary, or at least it was, haven´t been there for years. 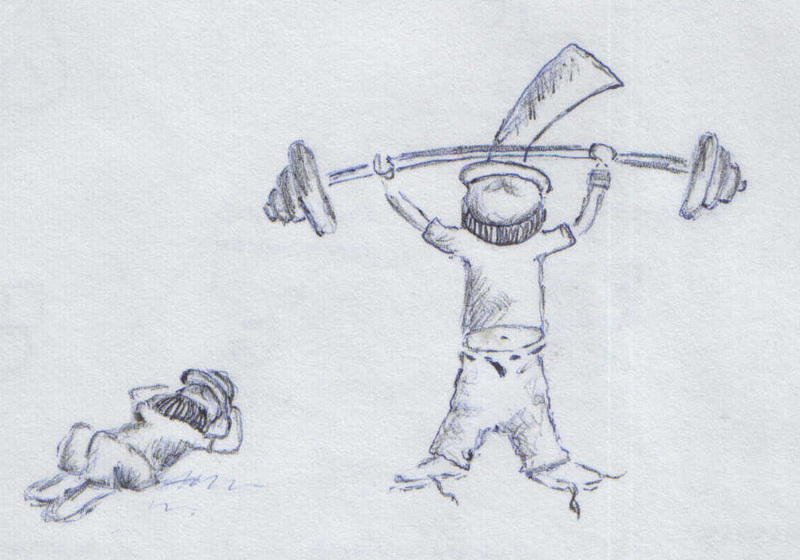 You may encounter in some of the pubs, real Anglo Saxons descendents, keep a look out, you´ll know when you see one. From here continue west along Albert street until you get to the crossroads at Gungate. Here you will face a dilemma, if you´re feeling peckish there´s a thai restaurant on the corner or you can carry on to the Globe Hotel, a fine example of a Victorian pub palace as described in Tamworth Heritagepubs. From here you enter a more residential area empty of pubs. 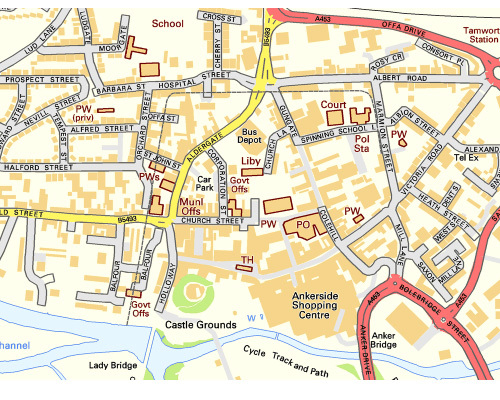 Go along Hospital street, stop at the corner shop with Orchard Street and while you´re buying some maltesers imagine you´re standing on the corner of the renowned King´s ditch. Continue along Orchard street, go past the St Johns club and the borough council buildings onto the White Lion the penultimate and well deserved resting place. From here a short step to the last pub, right next to an excavation of the ditch, called the Three Tuns. … That´s it the King´s Ditch pub crawl! This is a call out in Timeteam or maybe big dig style for anyone living on the course of the defences to have a look around, you never know there just might be a telling dip in the garden, a cellar with adjoining wall, anyway would be amazing to hear any stories. Also memories of the remains would also be great to hear. Below is a map with the houses and adjoining back yards where there might be evidence. I think the corner of Hospital and Orchard street is the most promising place for some sort of evidence, maybe a rise in the garden. I´m really enthusiastic about this idea so I´m going to risk the ridiculous and am going to try and post a call out on the Tamworth Blog! This post is far too long and has got out of hand!